5 count them, 5 bats. 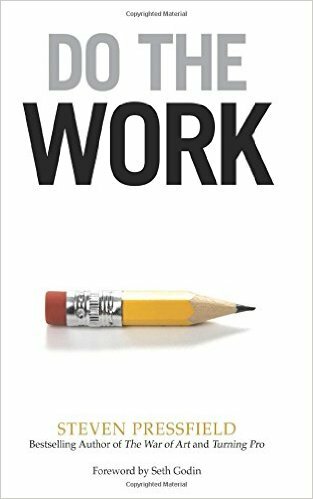 Do the Work is another gem from author Steven Pressfield’s trove. He also wrote The War of Art – which is a worthy read as well. I like his website too – it has lots of spiffy things for readers and writers alike, including Writing Wednesdays. This is a great book that tells it like it is. No muss or fuss or long, tiring diatribes into psychology. Steven keeps his prose punchy with lots of space making this quick to read while at the same time not skimping on content. Do the Work is one of the few books on increasing productivity that had me laughing and engaged from page one to the end. It’s short, which is a refreshing break from the norm in this genre. His chapters are broken into tiny segments so busy readers can snag reading time in those elusive free moments of life without feeling like they’re constantly stopping in the midst of a chapter or worse – feeling lost when they return. The information in Do the Work is valuable to anyone who wants to DO something with their life – writing a novel, launching a business or becoming the top squirrel hunter in the US. Whatever the goal is, this book will arm you with the motivation to accomplish it. And better yet, it contains hints and tips to make the journey less daunting. Loved it. Though admittedly, I almost marked this down a half bat (poor, poor little bat) for being too short. Then I remembered that I loved this book because it is short and succinct in a normally long-winded genre. Split-personality or simply a case of wanting my pie and eating it too? You be the judge. Steven’s other titles include: Last of the Amazons, Tides of War, The Warrior’s Ethos and more. Do the Work is one of my favorites for the very reasons you mentioned. I like to use Pressfield’s books as part of my Miracle Morning practice. Because they are so jam-packed with fodder for the brain, I limit myself to reading five pages per day and take time absorbing the messages for that day. His books are like devotionals for creatives.